I heard about Tophatter via Tim Adams over at Handmadeology. But before I go on about Tophatter let me give you a tiny background about that...Handmadeology is one of those places I locked into when opening my Etsy shop. When I posted my Etsy tips I suggested picking a few places to really get familiar with and focus on when trying to dive into the whole "networking" portion of running/starting an Etsy shop; Handmadeology was one of mine. I love Tim, I don't know how many hours are in his day, but it seems more than mine! I trust his suggestions and being apart of the Handmadeology community has been really great for me and my Etsy shop. But I must admit Tophatter sounded a little "different" to me but I figured I would try it out as I was invited to be apart of an auction hosted by Tim and Handmadeology. Honestly, I felt a little trepidation, I thought it would be confusing and just wasn't sure about it. But I also figured this could be something to check off my virtual list of "been there, tried that." So what is Tophatter anyway? Tophatter is an online auction site. "Sellers" submit an item and price it below it's retail cost. "Bidders" bid on the item in one to two dollar increments. It's interactive and moves pretty quickly. You can chat with other people attending the auction, ask questions, give nice compliments and other fun stuff. The items range from vintage to handmade and everything in between. So what did I think about Tophatter? Was it as confusing as I thought? Not so much. It's actually really, really easy. To get started as a seller literally takes under five minutes. And you know a lot of things claim that but it's never true. I am not saying they are claiming that but it IS true, so stinkin' easy, you will probably feel like you missed something. First you set up your profile where you will include your paypal email address (this is how you get paid) and that's it; it is really that easy! Then you submit a photo (or three) of your item, choose a minimum price for your item to start at, write a description, pick an auction, (They have a lot of auction "themes": home decor, jewelry, designer footwear, bath and beauty... Based on how you categorize your item, tophatter will suggest auctions for you to join. 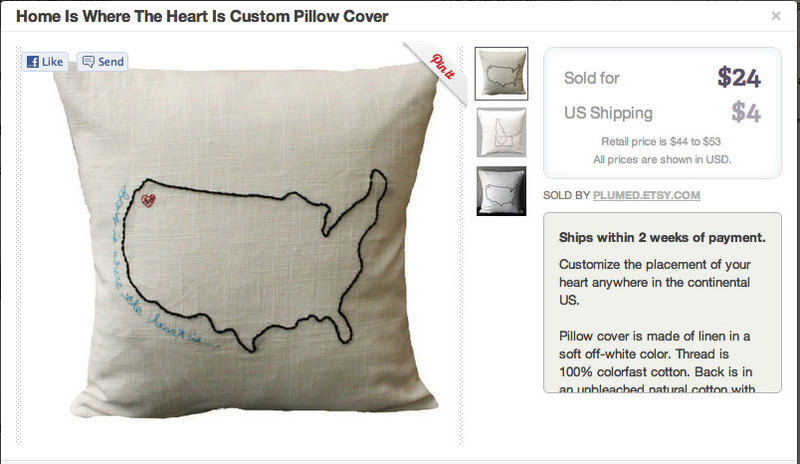 For me I chose my "home is where the heart is pillow" which normally retails for $49.00 in my Etsy shop, Plumed. I started my bidding at $24.00 and that's exactly what it sold at. I immediately received payment via paypal and communicated easily with the buyer via the email I provided when I signed up. So here are my first thoughts and impressions on Tophatter based on my experience. So, the auction I participated in was a private auction and I think because of that there were not too many people attending. And the people who were attending were mostly other Etsy sellers. In public auctions anyone can join at anytime. I am going to bet that, for obvious reason, this is the better route to go. After my first experience on Tophatter, which was where I was a "seller" and sold my pillow, I started watching other auctions. The public ones have so many people in them! (Like 100 more people than the auction I was in). Some items actually sell above their retail value or at least close to it. But even if your item sells for a lower value than retail, I look at participating in something like this as advertising if nothing else. Again, if you do a public one. One thing I like about Tophatter, as a seller is, I try to keep my shop aesthetic very streamlined, I sell pillows and only pillows. But I sometimes like to make others things too! I think Tophatter could be really great for those who either don't make enough items to keep an inventory in an etsy shop or for those who would like to sell a few of another item(s) but don't want to add items to their existing Etsy shop where it wouldn't look as cohesive. It could be especially beneficial for those who want to try out selling their wares in a very easy way; no shop set up, no banners or avatars to make. Just note you do have to have a paypal account. As a seller I also think this could be a good way to test out new products you make and prices for that product. For Etsy shop owners I can see using Tophatter to clear out some of your inventory being a fabulous place to do so. We all know you can get buried on Etsy so that great sale item just might not be reaching the masses. You have items from a few months ago you'd like to clear out but not take a total loss on? Try one of these items out on Tophatter first to see how you like it. Again, for Etsy sellers, not everyone who visits Etsy is prepared to buy when they are looking. But it seems those on Tophatter are ready to make a purchase. This is a huge bonus in my book! You don't have to attend the auction. You can enter it before-hand and then just go back and see what happened. Though they will send you an email if your item sold. If you do attend there is a chat board so you can answer questions or give more info, but be aware it goes really quickly so you may want to be ready with your info a minute or two before your item goes up. The fee is a little steep in my opinion at 10% with a minimum fee of $1.00. So for my pillow cover my bill was $2.40. And keep in mind you will also pay a fee to paypal. A pro to this con however is, you also charge for shipping and you set all the prices yourself. There are no rules for pricing your items so that is good. Of course they suggest pricing it well below your retail value, but it's all up to you. You can get amazing deals!! People tend to start their items priced at about 50% below their retail value. If you LOVE something and no one else in the auction is bidding on it, you can score big time. The whole time I am watching an auction I am thinking "Christmas Presents!" The auctioneer announces each item before it goes up for auction and the specs of that item will be announced, such as, the normal retail value and shipping. You can also look at the upcoming items and even set up a text alert for when that item comes up so you will be sure not to miss it! Many sellers on Tophatter do have Etsy shops so it can be a great introduction to finding a shop you will want to return to down the road. Bidding is easy too! It goes really quickly, each item is up for maybe a minute if no one bids on it. If an item gets a bid that clock seems to start again, so you will have time to press the "bid" button. Tophatter is pretty new. I can see it really taking off in the future, or I could see it tanking too, so trying it out now to get a feel for it is a great idea. Until it gets a bit bigger I don't think I will be putting up anymore of my embroidery pillows as they are just too labor intensive to sell at such a low cost. I am totally happy I tried it out and it was worth it for me to get a feel for the site. (I also sold to another Etsy seller who is super sweet and that's, you know, priceless!) Of course in the future I could raise the minimum bid but it's an auction! People are there to get great deals! So with that I am not sure it's great for items that are very time consuming. As a seller of handcrafted goods, you need to make sure you are paying yourself for your time! My suggestion is to sell items that you won't feel disgruntled about if they sell for the minimum bid. I personally, can see going back to sell items from my Etsy shop that have been sitting stagnent for awhile and that I would be happy to sell for half of my original retail price and eat that 10% fee. As a buyer, I think it's pretty awesome. Though, I haven't seen a feedback area for the sellers, so it may be a gamble there. But I think many of the items you can get at the amazing prices are worth the risk. Have you visited Tophatter before? Have sold or purchased anything? What do you think? Is it the next big thing? Notes: This is all my opinion from my experience. I use "etsy sellers" loosely, mainly because that's what I do, but this can be changed to any seller, crafter or artist of any venue! Stopping by from VB! Sounds like a fantastic idea! Would love to try it and add a million new things to my TODO list. I have never heard of it. Someday when I get the time to really start my knitting business, I will have to look into it. I guess it would be a great way to set the price on an item. That sounds great! I have an etsy shop but only a couple of items, so it really doesn't seem worth my time. This sounds like a great way to get rid of that stuff and still make a dollar or two. And who doesn't love a bargain? Thanks for the advice! I've never heard of this site but I'm in the process of opening an Etsy shop so this is very helpful to know-- gotta go check it out! thanks for sharing your experience. i was invited to participate in a private auction so i am not sure what the protocol is for the public ones; i didn't realize it was so complicated! this is great to add to this post that it may not be quite as simple as i thought it was through my experience! i imagine with it still being fairly new, they will be working out the kinks for awhile. thanks again for the info!